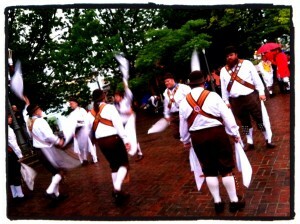 The Foggy Bottom Morris Men bringing in the May (May 1, 2012). Photo by Elizabeth Miller. Happy May 1st to all… how have you spent your May Day so far? 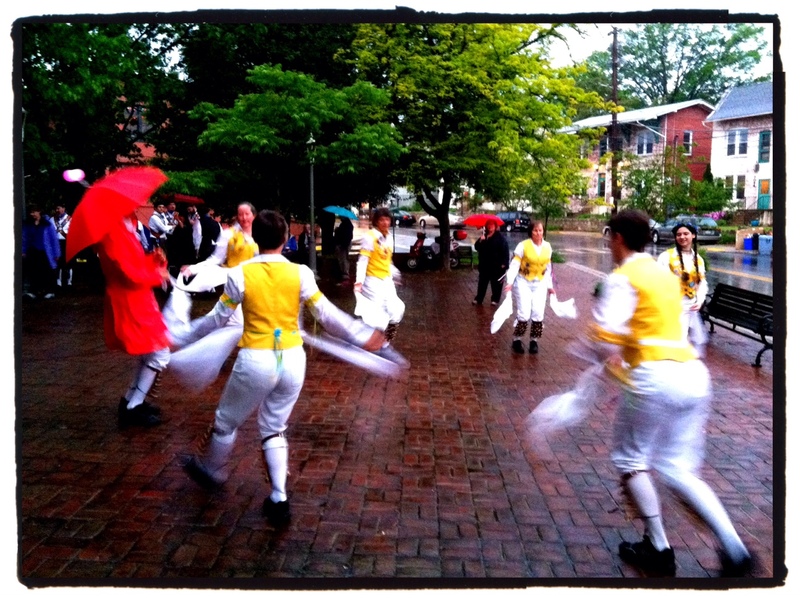 I was lucky enough to get up at 6:00 am, travel down the street to the Takoma Park Gazebo, and watch three morris teams do their very best to “bring in the May.” It was raining, but this did not prevent some very spirited dancing and waving of hankies (as shown on the right). And, it seems that what they did this morning really worked! The sun is now shining and the temperature is rising. On hand were the Foggy Bottom Morris Men, the Rock Creek Morris Women, and the Arlington Northwest Morris (recently featured as part of our “Madrigals, Morris, and Maypole” event at the National Arboretum last Saturday). Many other Washington Revels friends were playing in the band (Charlie Pilzer, Jennifer Cutting, Alan Peel, Jim Besser, and more… ) and many others (like me) were cheering on the dancing. I held my umbrella in one hand, and Arlo’s dog leash in the other and just enjoyed the fun. Since Jennifer Cutting and I both work at the Library of Congress, I wanted to share a link to a wonderful video (with lots of interesting links for more information) entitled, Bringing in the May, featuring Jennifer, who is a specialist at the American Folklife Center. Check it out! 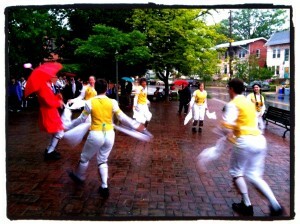 The Rock Creek Morris Women bringing in the May (May 1, 2012) at the Takoma Park Gazebo. Photo by Elizabeth Miller. Friday the 13th is a date that’s usually reserved for pessimism and superstition. Nothing could be further from the truth on Friday evening, January 13, when the Washington Revels Jubilee Voices shared in a warm, inspiring commemoration of the life and work of Dr. Martin Luther King, Jr. The guest artists were also invited to share songs from their own repertoire. The lyrics of one of the songs we performed, “Welcome Table,” promises, “I’m gonna eat at the welcome table, some of these days.” This spiritual, like many others, moved from its traditional, church-based roots to become one of the famous “Freedom Songs” of the Civil Rights Movement. Sung at sit-ins, during marches, and often, as protestors were led to jail, these songs spread the message of the movement and its people. The enthusiastic audience at Temple Shalom sang along, continuing the tradition! Our friendship with Cantor Lisa began early last year, just after recording the Washington Revels CD, Hard Times Come Again No More: American Music of the Civil War Era, produced by recording engineer Charlie Pilzer at Airshow Mastering. 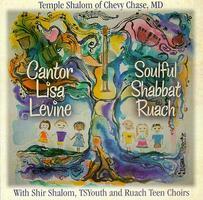 Cantor Lisa, who was recording Soulful Shabbat Ruach at Airshow, was seeking gospel singers to sing on two songs on the album. 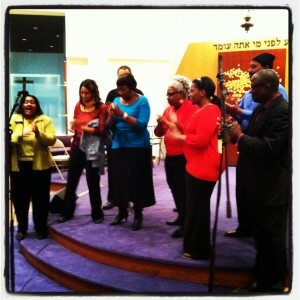 Charlie played the Jubilee Voices cuts from Hard Times for Cantor Lisa, and the rest was history, culminating last May when members of Jubilee Voices joined forces with Cantor Levine and the Temple Shalom choirs and bands to celebrate the release of Cantor Lisa’s CD last May.